I have had an epiphany. As popular as my YouTube account has been at times, I decided to dedicate this blog to showcase what concerts I've attended and display their respective footage and reviews on this blog. I guess it's kind of what I've done in the past but with more of an emphasis on the videos themselves. Really, the only changes will be less random posting about me and providing more original content that I've recorded. It should be fairly easy to keep the blog and YouTube account updated since I am now living in New York City and shows are abundant; doesn't hurt that some are free. With that said, let's see our first contestants. Over this past weekend, I was fortunate enough to see a couple of bands I've had my eye on for quite some time. I'm speaking about New York's own Pains of Being Pure at Heart and Vancouver's Japandroids. Let me first say, they both did not disappoint. Pains of Being Pure at Heart played a free show at the South Street Seaport as part of the River to River series. Their set was full of vibrant, pop songs that were full of life. Not flashy or flamboyant, the band kept true to their sound and provided the crowd with an hours worth of infectious rock. 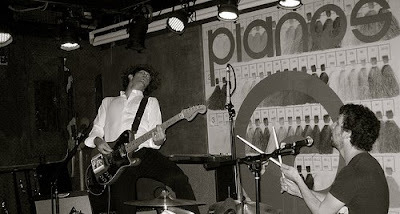 On Saturday, I got to witness the raucously aggressive Japandroids at Pianos. Wow. From the get go, they were exploding with energy. The duo, Brian King and Dave Prowse, was more than enough to fill the small venue and beyond with pulsating drums and distorted guitar riffs; I don't think a four-member band could produce the amount of sound they did. Though the audio on the videos do not do the band justice, believe me, they were loud and awesome. A definite two thumbs up. They will be back in New York to play the free Siren Music Festival at Coney Island this coming Saturday (07/18). Check them out.